When you wish your expression of gratitude to be as unforgettable as the reason for it, this extraordinary bouquet is a perfect choice. 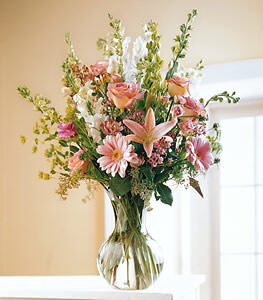 Beautiful roses, ranunculus, Gerbera daisies, and lilies in shades of pink are complemented by white snapdragons and larkspur. Bells of Ireland and seeded eucalyptus add the finishing touch.